When I work on projects organized as microservices, if I only update the part on which I work, it can happen that they are some bugs. It is then often needed to update regularly all Git repositories. So, I made a little Bash script as I did not found it elsewhere. If you wish to use it, simply clone it from the following Github page in the same folder where you have your other git repositories on which you are working on: https://github.com/KillianKemps/Git-Repo-Update.Usually you call it "workspace" or "dev" or something like that. 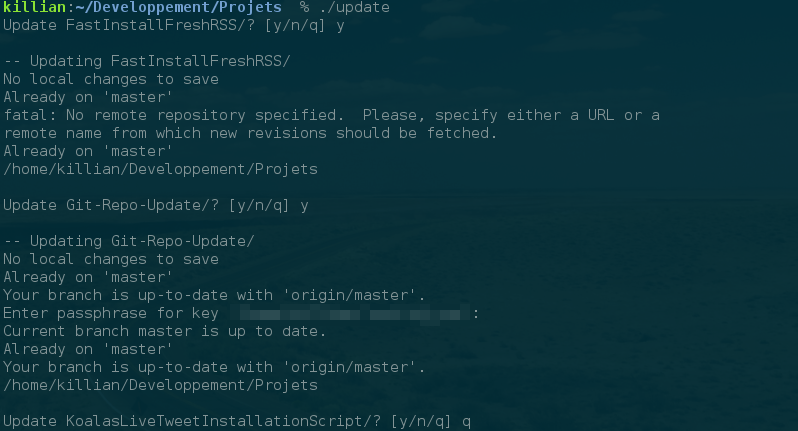 As written on the Readme, you have to give it execution rights if it doesn't have it yet and then create a symlink in the root of your folder containing all your git repositories. This way, it will simply prompt you for every folder one per one asking you if you wish to update it or not. If you are 100% sure you want to update every folder and avoid to confirm for every folder, simply add the -f or --force-yes argument. It is just a little Bash script I wrote as I did not found at first something doing it already, but now that I wrote the script, it happened that I found other ones. Note: For those who were already using the script before the 0.3, please delete the existing symlink and recreate it as I renamed the file name. You found an error in this article? Some advice? You can send a comment by email to "blog at killiankemps.fr" with "[Comment][en][You work on microservices? A script to update all your Git repositories]" as subject.